String quartet music from classical highlights till contemporary pop music for concert programs and lounge music performances. Cheerful, passionate and elegant chamber music group. We believe in that our commitment in music brings joy and delighted moments for us and for our audience as well. I strated to learn music in my birth-town Tiszafüred, Hungary at the age of 7. Through all of my education I felt special interest to play chamber music. I graduated from Széchenyi University Győr as violin teacher and chamber music artist, and recieved artist diploma from Debrecen University at 2009. Right after that I was member of North Hungarian Symphonic Orchestra Miskolc for 2 seasons, aslo was stage musician in a modern theater-piece at Csokonai Theater Debrecen. Since 2011 I am working as a freelancer musician , I took part in orchestra tours around Europe, just to mention the most memorable ones; with MAO and Ennio Morricone " My Life in Music", russian ballet theater perormances in France and Great Britain, french tour with the Classical Concert Chamber Orchestra and "Mozart+" tour with Bayerische Philharmonie. I had the chance to perform at sea on cruise ships playing with string quartets and piano quintet since 2011. These memorable travellings gave me so much chamber music experience and I am glad to had the possibility to view such parts of the World like the Caribbean Sea, the Mediterranean Sea and the Canarian Islands. 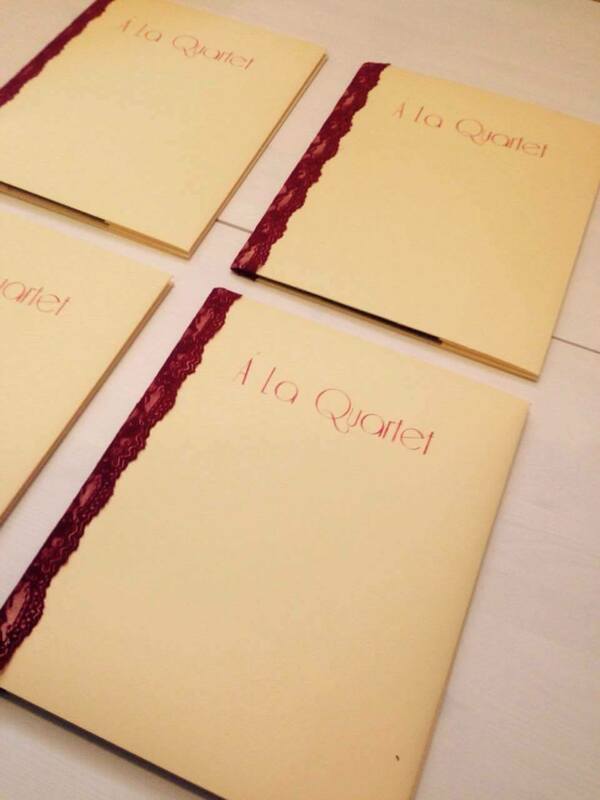 I am happy to work together with my friends in Á La Quartet. For me this group is a small island of freedom and creativity. In my freetime I love to listen jazz music, I am special inspired by my brother, Áron Tálas's groups. I started to play violin at the age of 7 in Budapest. During high-school, I became acquainted with the indescribable experience of community music. That was the first time when it was formulated in my mind that I want to be a professional musician. During the college years my instrument became as a device of self-expression. In 2007, I received my diploma as a violin teacher and chamber music artist in Debrecen. Then I participated in several different musical projects around the world. For me, self-expression and community experience is the two most important pillar of music and chamber music is the best formation to combine them. Besides I have been playing in symphonic orchestras for long, I have numerous opportunities to play as a soloist. However, from my point of view, participating in a chamber group is the most enjoyable way to perform. In the past few years, I played in several different chamber groups, but the formation of Á la quartet is especially a great joy for me since the harmony and pleasantry of the members both on stage and in everyday life contribute to the professional work and define the mood of our productions. We profess that classical music could be joyful, and as classical musicians we are glad to play light music tracks as well. I participated in viola and chamber music competitions and courses both in Hungary and in Europe. The chamber music was always important in my life, it’s a really complex activity. We have to attend to the others and play together or accompany but sometimes we have to be soloist. So this work is content everything what we learnt and it could be really varied. I played in many orchestras and travelled a lot in Europe, Asia, Mexico and USA and I work in symphonic orchestra now also. That is a really nice world but I need chamber music near that. This is a more intimate and more sensitive world. A lot of things can give by chamber music only. So I’m really happy that Á La Quartet came in my life. I knew the members earlier and I was certain it could work and that happened :-). This is a happy group in the life and on the stage in the same way. I started to play the cello when I was 8 years old. Since my early years I love to play in different music groups. Anna Tálas and I met in the music school, and playing together since 1999. I graduated as chamber music artist and cello teacher from University of Szeged in 2007. Not so long after I started to travel and played for 7 years around the world with other musicians, where I got influenced in playing light music, and make covers of famous evergreen songs. I performed in Qatar, Bahrein, Oman, Dubai, Japan, Indonesia and several countries in Europe in formations of duos, trios and quartets. With the A la Quartet we performed on cruise ships and participated various concerts in Budapest. Beside playing the cello, I love traveling and I am committed to yoga and meditation. 10. June 2017 19:00 Opera and Operette melodies with Szilvia Szilágyi mezzosoprano, Nádor Hall Budapest (tickets:port.hu)- pictures of the fabulous concert place and the event at the photos site! We arrived home to Budapest safe after a joyful contract on Mein Schiff 4 where we spent 2 month renamed as "Humboldt Streichquartet" under the vessel regulations. We visited beautiful places and gave many concerts on board, now we are full of memories and nice experience. We 've just finished studio work, recorded our promotion CD, including Divertimento by W. A Mozart, Phantom of the Opera by A. L Webber, and Take5, among others. Thanks for Lajos Géczy our sound enginier and SoundLine CD for the collaboration! This site is designed and created by Anna Tálas with one.com © Copyright. All Rights Reserved.